Bacteriophages are believed to be the most abundant lifeform on earth, with estimates ranging up to 1031 particles. These different particles contain huge amounts of genetic variability that is greater than any other group of organisms and arises from the ability of phages to horizontally transfer elements of their genomes. In order to replicate, phages bind to and infect their host organism before subverting the host’s transcription machinery. Unlike other host-parasite systems, phages have developed different levels of virulence, resulting in either the destruction of the host organism (lytic) or the incorporation of the phage genome into the host (lysogenic) as the primary forms of replication. It should also be noted that other minor types of phage replication can occur in which the phage can exist as plasmid DNA with the host or can be released from the host by budding rather than lysis. Our group studies the complex host-parasite relationship between host and phage as well as the development of phages for application in therapy. Nilsson, A. S. (2014). Phage therapy—constraints and possibilities. Ups. J. Med. Sci. 119(2): 192-198. Replication of phages (black hexagonal shapes) within host cells. 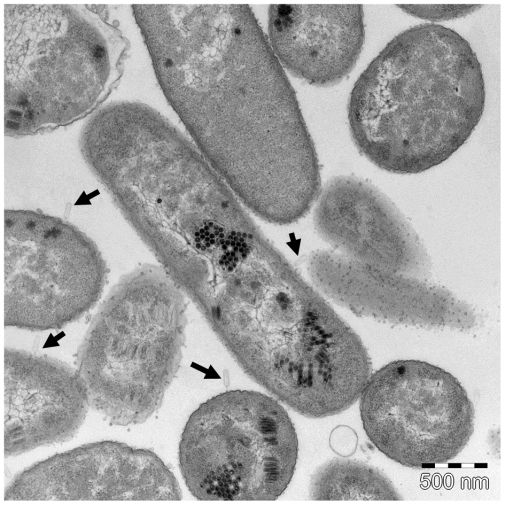 Empty phage capsids can be seen interacting with bacterial surface (black arrows).